Archer on Airguns: There's no free Lunch! QB78 family muzzle velocity, temperature and CO2 use. There's no free Lunch! QB78 family muzzle velocity, temperature and CO2 use. I’ve always been interested in the effect of temperature on CO2-powered air rifles, such as the QB78. But, until I developed the Archer Airguns QB78 Temperature Monitoring Kit - based on an idea from local Rochester NY airgun enthusiast Doug Wall - I didn’t have a way to measure what happens as we fire our air rifles and use the CO2. Now, I’m going to apologize immediately for the part hand-drawn, part Excel graph, but I think it shows a behavior of QB78 air rifles that has not been recorded before. This shows how the temperature of the Main Tube (and therefore the CO2) falls with the number of shots fired until - I believe - all the liquid CO2 is used. After that, as the gun starts running on CO2 gas only, the temperature of the gun rises again until the gas is exhausted and the muzzle velocity collapses. It also shows how increasing muzzle velocity is purchased through the use of increased amounts of CO2. We can see how improving the gas flow causes the temperature of the gun to decline faster under constant shooting rates and how the liquid CO2 is used faster to buy the increased muzzle velocity. 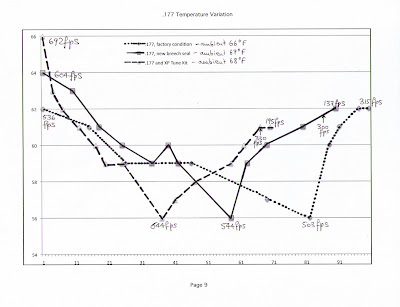 This graph takes three tests on the same .177 cal QB78 air rifle and compares the temperature of the Main Tube (measured by the Archer Airguns QB78 Temperature Monitoring Kit) in three configurations. First, I tested a standard factory gun. Second, I modified this gun with a replacement breech seal from the Archer Airguns 2X Seal Kit. Third, I fitted an Archer Airguns XP Tune Kit to the gun. In each case, the gun was charged with two full 12g Powerlets and fired every 30 seconds until the muzzle velocity dropped to around 300fps. Click the graph to enlarge for easier viewing. As you can see, the ambient temperature increased slowly in the range as I undertook the tests - must have been all that hot air I was generating! So, the factory spec gun was tested at 66 degrees F ambient temperature. The first shot attained a mere 536fps (this was a “slow” gun) at a Main Tube temperature of 62 degrees F. The temperature dropped steadily until it reached a minimum of 56 degrees F after about 80 shots and the muzzle velocity had declined to 503fps. Then it increased again to 62 degrees F as the muzzle velocity dropped away to 315fps after about 100 shots. By comparison, the same QB78 fitted with a replacement breech seal from our Archer Airguns “2X’ Seal Kit, started at 64 degrees F with a muzzle velocity of 604fps, dropping to 504fps after about 55 shots and finishing down at 300fps after about 80 shots. Fitting the Archer Airguns “XP” Tune Kit, increased the muzzle velocity of shot one to 692fps (an increase of 156fps over the factory configuration!) at 66 degrees F, but the liquid CO2 was used after only about 35 shots at 644fps. The 300fps point was reached after about 60 shots. So, at a constant shooting rate, the QB78 cools faster with increasing gas use (ie higher muzzle velocity). The temperature of the gun increases again after all the liquid CO2 is used. The practical application of this data is that tuned guns may need to be shot more slowly to maintain their muzzle velocity - and therefore vertical point of impact on the target. The standard factory configuration gives more consistent muzzle velocity over a much larger number of shots and the gun cools much more slowly. Lower muzzle velocity is better for paper-punching accuracy. 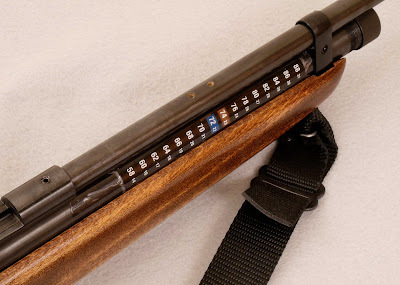 Below, the Archer Airguns QB78 Temperature Monitoring Kit reading 73 degrees F.
Just found your Blog site and have really enjoyed picking up much information on the line of rifles you carry. The article on Muzzle Velocity, Gas Use and Temperature is excellent and I'm glad to read and understand this kind of data. Yes, I agree. The factory stock version is fine for paper-punching and is most economical on gas use. For hunting, the XP Tune Kit certainly provides the power increase required, but it uses more gas to do so and is also louder. One other thing. I waited 3 minutes after piercing the Powerlets before starting to shoot. The reason is shown in another post. A larger CO2 reservoir (e.g. 88g bottle on QB79) will mitigate the cooling effect of a gun in a high state of tune. Thanks for the excellent point. Yes, the larger volume of gas available in a QB79's tank will mitigate the cooling effect - and also be beneficial if the gun is fired rapidly. Don't try this with your QB78, folks. The Crosman 88g Adapter is Available Again.